All fans of the works of Sir Terry Pratchett are invited to come and help the Discworld Emporium celebrate Hogswatch in Wincanton on the 28/29/30th November 2014. There will be fun, jollity, fantastic food and a possibility of quaffing. This weekend fans of Terry Pratchett descend on Wincanton High Street for the Discworld Emporium's Hogswatch celebrations on the tenth anniversary of the official twinning between Wincanton and Ankh-Morpork. Join in the fun and celebrate our town's unique literary link. From the 4th to 7th May Discworld fans will be coming to Wincanton for their Spring Fling. There will be lots to do and see, so do pop into the Town at the weekend and join in the fun. Olympics? The Gods are coming to Wincanton! The annual Spring Fling for fans of Sir Terry Pratchett's Discworld is happening the weekend of 4th - 6th May, the theme being Discworld Gods and Goddesses and Mr Shine - Him Diamond - he's a Troll, for the uninitiated! 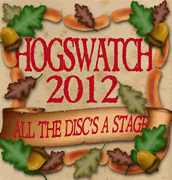 Hogswatch Weekend - The Discworld Christmas! 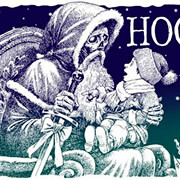 Once a year fans of Discworld come from afar to celebrate Hogswatch Weekend - our version of Christmas! The last week of November was no exception, when Wincanton buzzed with many strange sights, all in the name of charity and fun.